A born leader, Aric Jorgan is one of the Republic's most capable field officers. He enlisted in the military at an early age and quickly distinguished himself as a talented marksman. His impeccable service record earned him a spot in the Republic's top sniper squad, where he successfully carried out over a dozen missions against high-ranking Imperial targets. Since his transfer to Fort Garnik, Jorgan has earned a reputation as a hard and demanding taskmaster. However, few realize his surly demeanor belies a genuine concern for the well-being of his troops. While those under his command may not particularly like the brooding Cathar, they almost always respect him. A highly talented field medic, Elara Dorne was born Imperial and served in the Empire's military for two years before defecting to the Republic. She has since served with distinction as a search-and-rescue squad leader, earning several commendations for aiding wounded men under direct enemy fire. Her operational record is flawless. What no record can show is that Dorne's background, combined with her strict adherence to regulations and rigid, uncompromising personality, has made her fairly unpopular with her fellow soldiers. 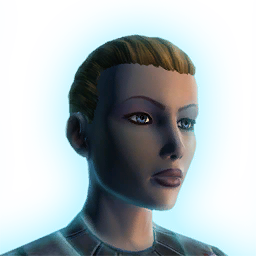 In truth, she's widely regarded as a cold, asocial killjoy, an unfortunate side effect of her dedication to embodying the laws and ideals of the Republic. M1-4X is a highly advanced war droid designed and built specifically to serve in Havoc Squad. As such, his engineers programmed him to be a perfect soldier: completely loyal, fervently patriotic, and willing and eager to go to any length or face any risk in order to destroy the Republic's enemies. M1-4X's armor plating, weapons systems and processing power are significantly advanced over typical military droid standards, due in large part to his unusual power core. Constructed by an unknown group or organization, the core was recovered during a classified operation and has output capabilities far beyond conventional models. Even in an organization as diverse as the Republic Army, Yuun stands out. A member of the Gand species and hailing from the Gand homeworld, Yuun is a Findsman, a type of shamanistic tracker held in very high regard among his people. He applies his unusual training to technical tasks of every kind, resulting in a success record unmatched by any other technician in the military. As effective as Yuun's methods are, they rarely meet with understanding or approval from his fellow soldiers. But despite his eccentricities, Yuun's fighting skill and calm approach to any challenge generally earn at least the grudging respect of the men and women he serves with. One of the most talented demolitions experts to ever serve in the Republic military, Tanno Vik is charming, highly skilled and completely amoral. Born to the lawless streets of Nar Shaddaa, Vik is accustomed to putting his own interests first; enlistment was merely a convenient means of escape after betraying one criminal partner too many. But once he got his hands on the most advanced weapons and explosives in the galaxy, he was hooked. During training, Vik impressed his instructors with his unprecedented speed at locating structural weaknesses in everything from buildings to vehicles, ensuring that he always planted his explosives where they would do the most damage. He was even considered for entry into Special Forces division, but his belligerent attitude and disregard for authority held him back. Criminal accusations were registered against him throughout his short service career, leading to his eventual conviction and discharge.